Here is an example of a photo that I did not set out to take. When I first walked onto the beautifully Halloween-themed Buena Vista Street, it did not take long for me to notice the awesome bats flying out of Carthay Circle. I got straight to work searching for an angle that would best accentuate those bats, but while I circled the area trying to find such an angle, I happened upon this frame. While it may still draw your eyes to where the bats are in the frame, it’s a far cry from a glamour shot of the little winged rats. But the frame was just too perfect for me to deny, and now you all get to see the little Halloween street where those Buena Vista bats live. 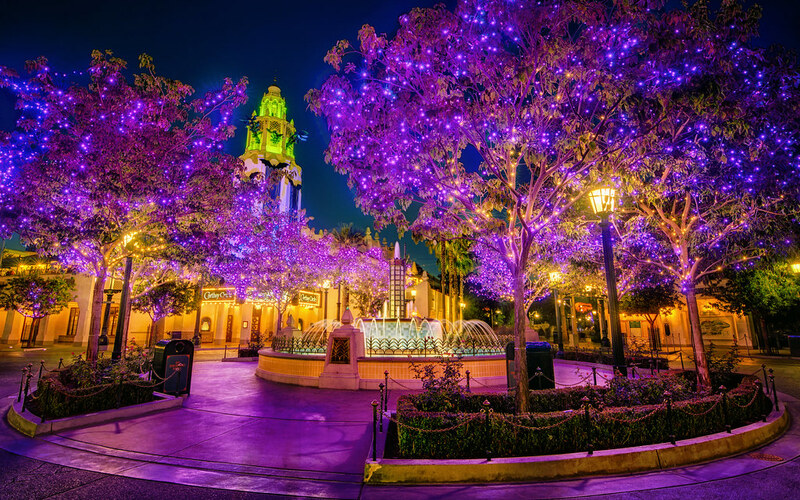 This entry was posted in Buena Vista Street and tagged bats, carthay, creepy, decorations, fountain, glow, Halloween, HDR, lights, night, purple, scary, spooky, trees. Bookmark the permalink.